The first trailer for Cloverfield 3 aired during the Super Bowl, revealing the title Cloverfield Paradox. Ten years ago, some thing arrived. Today, we know why. Cloverfield Paradox premieres on Netflix tonight after the big game. Netflix has done the unthinkable and released a secret trailer for The Cloverfield Paradox during Super Bowl 2018 and it will be available to watch this evening after the big game. For months, the movie was known as God Particle and not much information was available until now. The footage looks creepy and suspenseful. The Cloverfield Paradox was originally supposed to hit theaters this month, but it was later announced that the movie was going to be pushed back and released on Netflix. Netflix just made history by releasing the secret trailer during the Super Bowl only to release the movie directly after the game. The project has been a long time coming and has been a mystery to everybody, which makes this surprise release such a big deal. Reshoots that were overseen by J.J. Abrams pushed the release of The Cloverfield Paradox from February to October of last year and then pushed back yet again to April of 2018. Many fans were skeptical that movie was going to be released at all, but now those fears have been put to rest thanks to Netflix's groundbreaking promotional campaign. 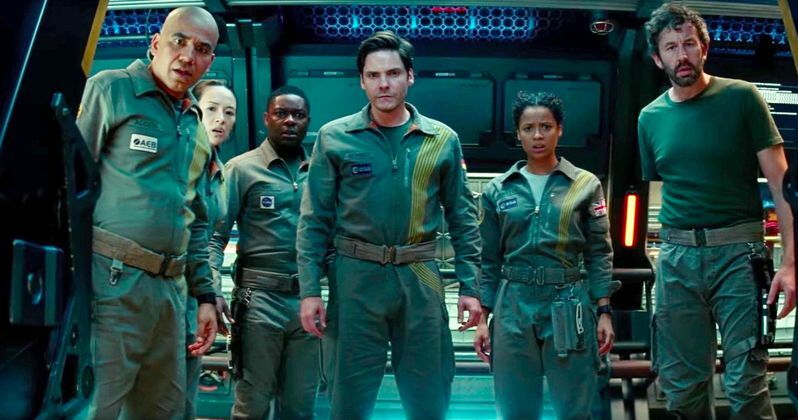 Another piece of exciting information is that The Cloverfield Paradox appears to be connected to the first movie, something that 10 Cloverfield Lane was not. As it turns out, Oren Uziel had The Cloverfield Paradox written before 10 Cloverfield Lane, before the set of movies was announced as a franchise. While we still don't know much about it, the synopsis reads, "In the near future, a group of international astronauts on a space station are working to solve a massive energy crisis on Earth. The experimental technology aboard the station has an unexpected result, leaving the team isolated and fighting for their survival." However, we'll finally be able to see the movie tonight, after the Super Bowl ends. In a big a day for sports and entertainment, Netflix just dusted all of the competition with the top secret Cloverfield Paradox trailer and stunning release. The talks of Jurassic World: Fallen Kingdom, Mission: Impossible 6, and Solo: A Star Wars Story have been silenced and replaced with talks of Netflix and The Cloverfield Paradox. It may have looked like the third movie in the series had been dropped when it shifted hands to Netflix, but that was obviously not the case. There are a lot of options of things to watch after the Super Bowl, but it looks like Netflix might have to worry about a possible server crash due to their intense marketing today. The movie stars Daniel Brühl, Elizabeth Debicki, Aksel Hennie, Gugu Mbatha-Raw, Chris O'Dowd, John Ortiz, David Oyelowo, and Zhang Ziyi, and it marks the feature directorial debut of Julius Onah. You can check out the trailer for The Cloverfield Paradox below, courtesy of Netflix's YouTube account and then watch the movie later this evening.